Our easy baked ziti with spinach and artichokes only requires about 15 minutes of hands-on time. 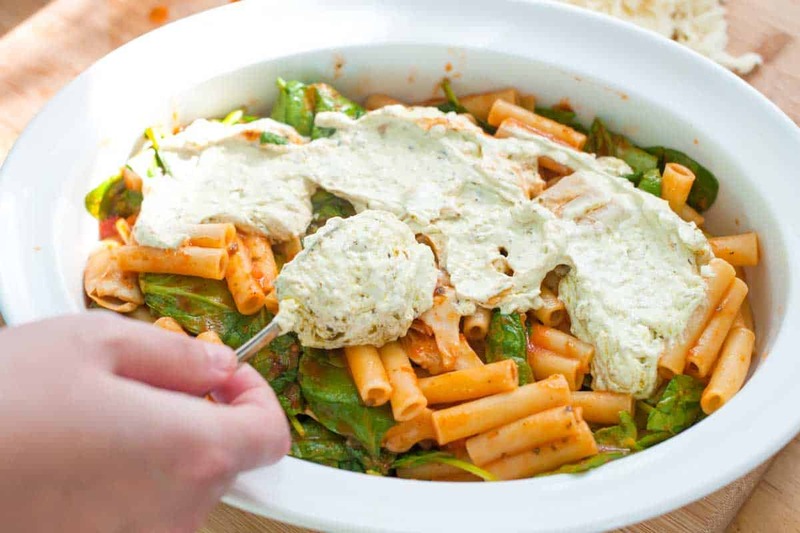 We add a creamy layer of sour cream, pesto, and cheese to the middle of the ziti, making the pasta utterly delicious. 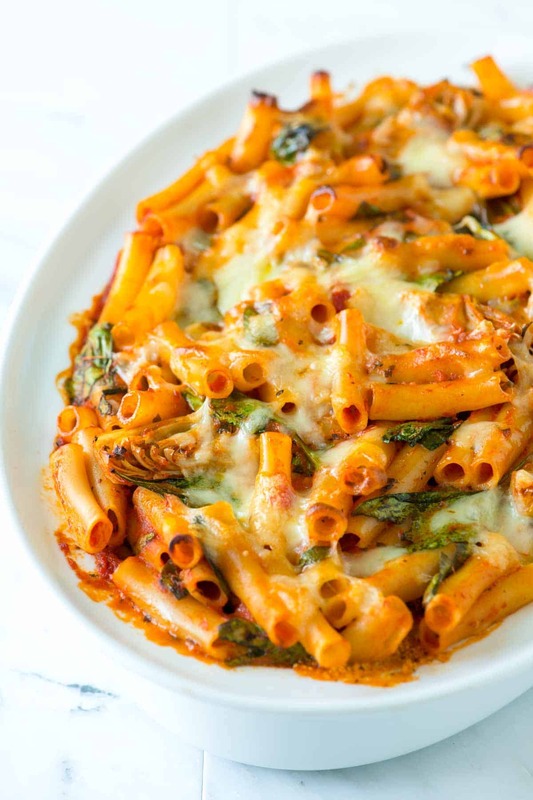 Jump to the Easy Baked Ziti Recipe or read on to see our tips for making it. If there’s one dish that will instantly make our knees buckle, it’s baked ziti. Just the thought of it makes us gasp. I’ll take baked pasta anyway I can get it, but this vegetarian version is loaded with spinach and artichokes as well as an ultra-creamy and cheesy layer of sour cream, pesto, and cheese. It’s ridiculously good! Start by cooking your pasta, but undercook it by 1 to 2 minutes. This way, when we toss it with the marinara sauce and bake, the pasta won’t become mushy. When the pasta is cooked, I drain it, but save some of the hot pasta water for later. The starchy pasta water helps to make the sauce stick to the pasta when it bakes in the oven. From there, I toss the pasta into a big bowl with marinara sauce (homemade or store-bought), fresh spinach, and the artichokes. For the artichokes, I use canned that have been drained. Before baking the ziti, I toss slightly undercooked pasta with marinara sauce, spinach, artichokes, and a little starchy pasta water. As you toss the ziti ingredients in the bowl, you will notice that the spinach will begin to wilt from the heat of the pasta. It will seem like a lot of spinach at first, but as it wilts, it becomes more reasonable. When everything is tossed together, spoon about half of the pasta, spinach, and artichokes into a baking dish then add a layer of creamy pesto. The creamy pesto layer is my favorite part of this baked ziti recipe. It’s such a treat and really simple to make. To make it, I stir sour cream and pesto together. 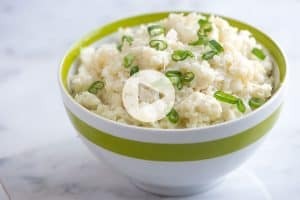 Cottage cheese, ricotta, and cream cheese are all excellent substitutes. 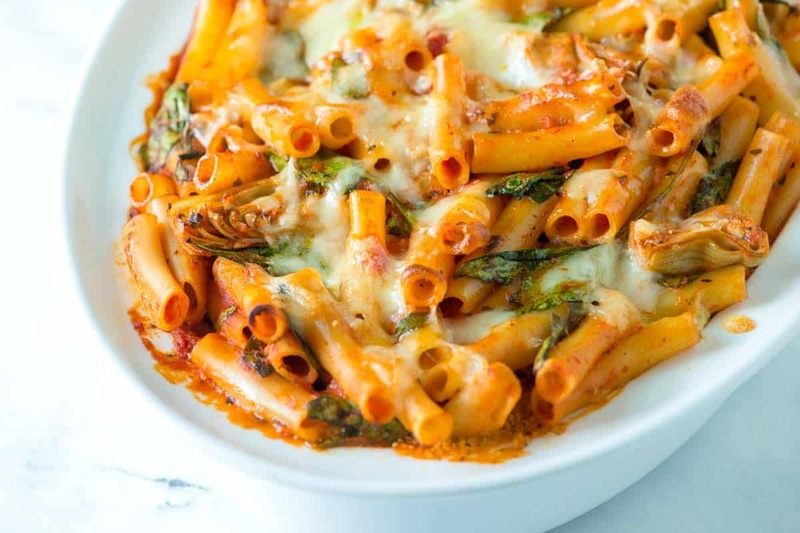 Adding a creamy pesto layer to the middle of the ziti makes this veggie baked ziti extra delicious. In addition to the pesto layer, I add some mozzarella cheese then top with the rest of the pasta, spinach, and artichokes. So that the baked pasta is extra cheesy, I add more mozzarella on top, and then bake until the sauce is bubbling and the cheese has melted. You can refrigerate the pasta unbaked. Cover and refrigerate the assembled, but unbaked pasta up to 2 days. When you cover, use parchment paper between the pasta and aluminum foil. Aluminum foil can react with the tomatoes. Another vegetarian pasta, this Easy Vegetable Baked Pasta has onions, bell pepper, and mushrooms. When the craving hits, I love making our Creamy Baked Macaroni and Cheese. It’s extra cheesy! No-boil lasagna sheets make our Healthier Spinach and Mushroom Lasagnaextra easy! For a meaty pasta, try our popular Lasagna with Beef and Sausage. Baked ziti with spinach and artichokes only requires about 15 minutes of hands-on time. A layer of sour cream, pesto, and cheese is sandwiched in the middle of the ziti, making it extra delicious. 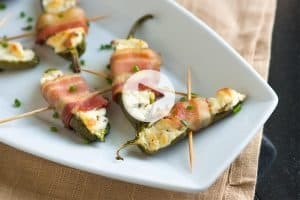 If you do not have sour cream, substitute with cream cheese, cottage cheese, or ricotta cheese. Bring a large pot of salted water to the boil, add the pasta then follow package directions, but cook 1 to 2 minutes less than the package calls for. Reserve 1/4 cup of the pasta water then drain. While the pasta cooks, warm the marinara sauce in a saucepan over medium heat. In a small bowl, stir basil pesto and the sour cream together until well blended. 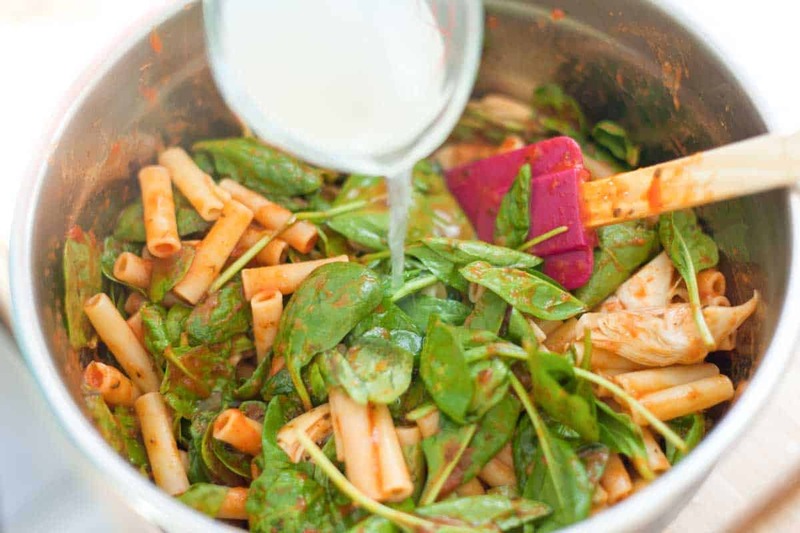 Add the cooked pasta to a large bowl with the spinach, artichokes, warmed marinara, and the reserved pasta water. Toss until the spinach has wilted and everything is well combined. Spoon half of the pasta into the baking dish. Spread the sour cream and pesto mixture over the pasta and scatter with half of the mozzarella cheese. Top with the remaining pasta, lightly press everything down into the baking dish, and then scatter remaining mozzarella cheese on top. 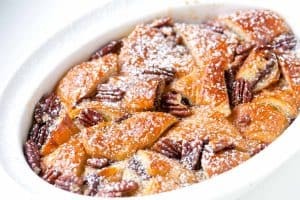 Place the baking dish onto an aluminum-lined baking dish (just in case any sauce drips over the sides of the baking dish). Bake until the cheese has melted and the sauce is bubbling, about 30 minutes. Let stand 10 minutes before serving. Hi Margie, You can. I’d cover and store the premade ziti in the fridge then bake at the same temperature suggested in the recipe (350F). You may need a little longer than the suggested 30 minutes since you will be starting with a cold dish. Just bake until heated through. Could I replace all the artichokes with mushrooms? 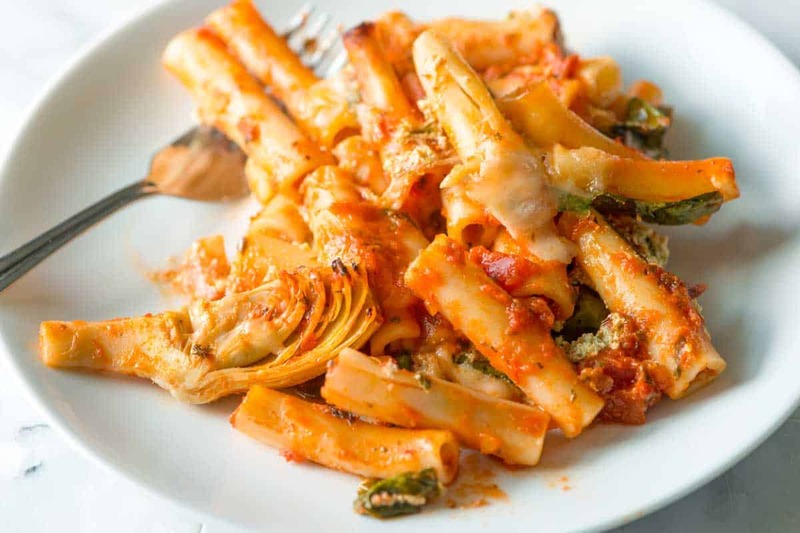 In your Easy Baked Ziti with Spinach, are the artichoke hearts marinated or plain? Hi Nancy, You can use either. I made this 2 times. We love it. So easy and good. Can the recipe be frozen? Wondering if you learned if this can be frozen? 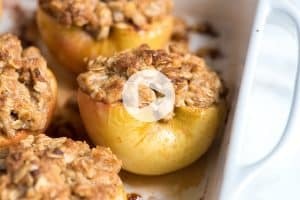 If so, how to adjust the baking directions? Hi Donna, Let it cool completely on a rack before freezing, and then wrap it very well with foil (we use two layers). You can freeze for at least 1 month. This is my new favorite dish. It was magical. The only change I made was sauteeing the artichokes with some mushrooms I had on hand to add some flavor to them and to use up the mushrooms. The basil pesto layer was amazing. The whole dish was. We’re newly vegetarians and regular baked ziti was a staple dish in our home but this was so much better. Will definitely be making again.